After my week on Skye I was looking forward to a different view, different terrain, and to meeting up with some old friends I had not seen for a little over 12 months. It was a beautiful sunny day as I drove down through Glen Sheil and Glen Garry, with magnificent views of glimmering lochs, bright green forests and snow flecked mountains. I was heading for Kinlochleven, at the head of Loch Leven, to stay at the Fell and Rock Club hut there, as a guest of my good buddy Les Meer. Sunday dawned cloudy and cool, but crucially there was little wind and the cloud was high, so four of us decided to go for the Aonach Eagach ridge, on the northern side of Glencoe. This iconic serrated ridge boasts two Munro’s and some of the best scrambling in Scotland, and is usually done east to west, with a finish at the Clachaig Inn, and this indeed was our plan. 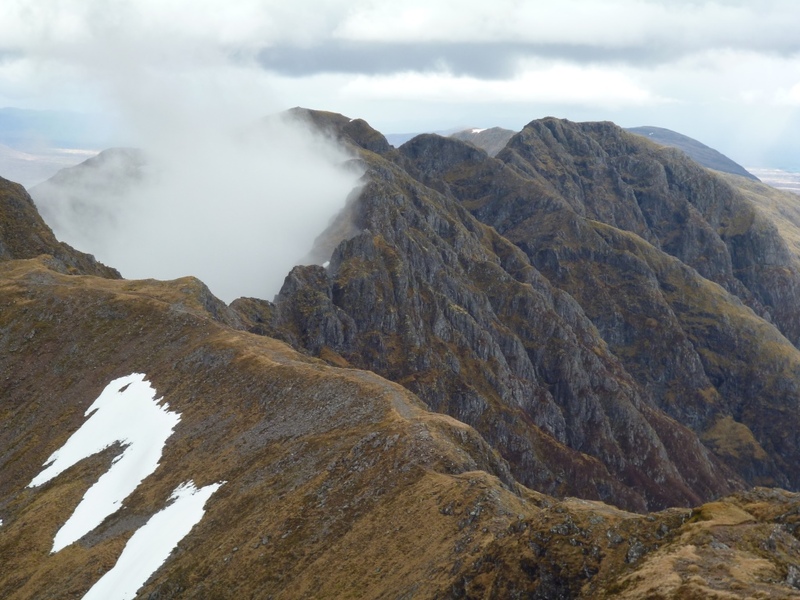 The ridge is a mix of easier walking sections and some grade 2/3 scrambling, most notably the Pinnacles, where the exposure is breathtaking, and a good head for heights and a steady nerve are required. 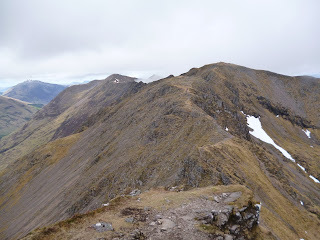 After the long pull on a well made path up to our starting point, Am Bodach, we picked our way along the ridge, first negotiating the down climb from Am Bodach, and then on to the first Munro, Meall Dearg. From here the going got harder as we approached the Pinnacles, and to add a little spice to the day it began to rain, making the well polished holds slippery and needing extra care, so much so that the camera stayed firming in my pack over this section! The rain eased and eventually stopped and too soon we reached Stob Coire Leith, pausing to take in the stunning views all around. To the north, Ben Nevis and the Mamores; to the south the huge bulk that is the complex mountain, Bidean nam Bian, still with a reasonable covering of snow; and to the west Loch Leven, Loch Linnhe and the seemingly never ending panorama of mountains beyond. 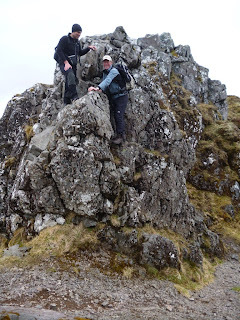 From here the route became easier, more of a ridge walk than a scramble, as we made our way on to Sgorr nam Fiannaidh, the second Munro and the end of the ridge. The old, traditional route down from here is the Clachaig Gully, but this has become eroded and very dangerous, so we headed across the slope below Cnap Glas, getting more magnificent views down Loch Leven and beyond, before reaching the road and our transport back to the Clachaig Inn for a well earned pint. 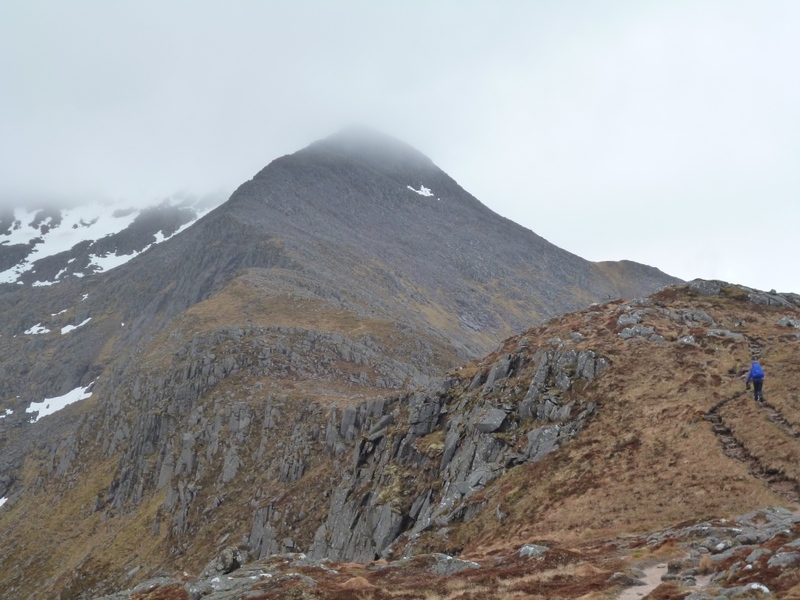 Day 2 – Monday, we planned to head down into Glen Etive and climb the 1078 metre Ben Starav and it’s neighbour Glas Bheinn Mhor, at 997 metres. Again the day was cloudy, but a little warmer than the one before, and it felt it as we began our ascent of the long north ridge of this imposing Munro. The summit drifted in and out of the clouds and light rain showers accompanied us as we climbed. Here too, the upper corries still held winter snow, and we felt the chill as we made the final push to the summit over a difficult and greasy boulder field. Winter had hardly released it’s grip on these mountains, the sparse grasses were brown and blasted, with very little sign of any new spring growth anywhere, despite it being the beginning of June. Lunch at the summit of Ben Starav was interrupted by more rain and we soon moved on along the pleasantly narrow summit ridge to the subsidiary top of Stob Coire Dheirg and then down the rocky east ridge to the bealach. 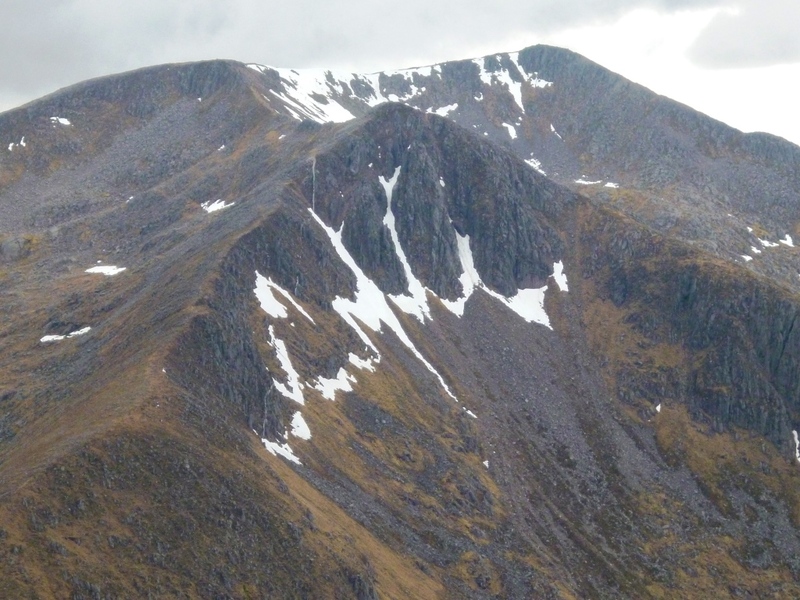 From here an undulating whale back ridge continued north east to Glas Bheinn Mhor, our second summit of the day. After a steep and scrambling decent to another bealach, we followed a lovely rocky path alongside the Allt Mheuran. Small tumbling waterfalls and the babbling rush of this small mountain stream delighting us as we made our way back into Glen Etive, down here in the glen there were signs that spring was beginning, with chattering birds in the brightly green birch trees and butterworts glowing yellow in the wet hillside flushes.